Columbus discovered America. Is this his ship? A shipwreck off northern Haiti may be the remains of Christopher Columbus' flagship vessel, the Santa Maria. But experts expressed caution about a discovery that was far from confirmed. Explorer Barry Clifford thinks the wreck he found is the Santa Maria. It struck ground and foundered on Christmas Day in 1492. The evidence includes ballast stones that appear to have come from Spain or Portugal. He also found what looks like a 15th century cannon. It was at the site during an initial inspection but has since disappeared. He said another factor is the location of the wreckage. The wreck was found in 15 feet of water near where the crew of the Santa Maria is thought to have built a coastal settlement. The settlement was for crew members of the ship who were left behind after the sinking. "The circumstantial evidence is overwhelming," Clifford said. "The cannon is the smoking gun, so to speak." He said that he and his son, Brandon, first explored the site and took photos in 2003. They decided to publicize their findings after a follow-up dive. An examination of the photos led them to conclude they may have found the Santa Maria. The cannon that they saw in 2003 had vanished by the time they returned last week. 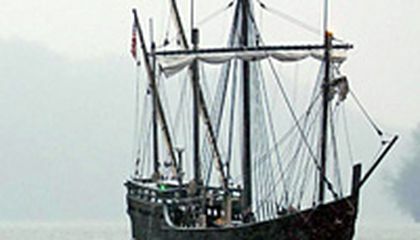 If the ship is the Santa Maria, it would be the oldest known European shipwreck in the so-called New World. It would be a find of major archaeological significance. But scientists say it's far too early to make any such declaration especially since there is likely to be very little left of the vessel. "The evidence, as you can imagine, after more than 500 years is not going to be very much because of time and the environment that the site is in," said Roger C. Smith, the State Underwater Archaeologist for Florida. "It's going to require some careful archaeology." Kevin Crisman is the director of the Center for Maritime Archaeology and Conservation at Texas A&M University. He said many Spanish ships sank off Haiti and the Dominican Republic. So it will be difficult to confirm that this is the Santa Maria. "Anything is possible in this world, but I would like to see all the evidence, and so far this is not too promising," Crisman said. The ship sank slowly in 1492 and the crew had time to strip it and remove valuable items that would help document the identity of the vessel. Much, if not all, of the ship's timbers would have broken down or been consumed by a species of wood-consuming mollusk found in the tropical waters. This assumes that the timbers hadn't been carted away by crew members who were left behind and never heard from again. "If whoever finds the Santa Maria can confirm that it's the Santa Maria, that's kind of like the Holy Grail," Crisman said. Critical thinking challenge: What acts of man and nature will make it difficult to confirm the discovery? That's really cool but I have to say, that's really old and I don't know how it would survive all these years. I think it would be amazing if it was the Santa Maria! I think that there's a slim chance of it being the Santa Maria but I think it's most likely to be a less famous ship. What I think is that they should go under water to explore that ship so they can know if that ship is that is Columbus. It will be hard to make out the ship's identity. The ship will be covered in coral and mosses. If they take the ship out of the water and it is not Christopher Columbus's ship. It may not be the ship because it sank so long ago that it could have been badly damaged and wore down and the scattered across the ocean and that ships have sank around there before there is no telling if it is or not. A ship wreck was recently discovered. It was off the northern coast of Haiti. The ship is said to be the wreck of one of Christopher Columbus's ships that he sailed with to America. They think it is the Santa Maria. Officials say that it is doubtful that this ship is the Santa Maria. I think that it is the Santa Maria. I also think that it is very cool that they discovered something this old. I don't think that would be the Santa Maria because the wood would have decomposed a long time ago and in the tropical waters this was sunk in the temperatures would be just perfect for bacteria and algae and other possible wood consuming creatures. They also said that the cannon disappeared I believe they were just over exaggerating, because cannons are made of rock back then and if there was any thing in the ocean strong enough to destroy stone it would also have destroyed the wood in the ship. It seems most likely that they just made their own ship in and attempt to get rich. There is really no way wood could have survived more than 500 years under the sea so this is probably fake. 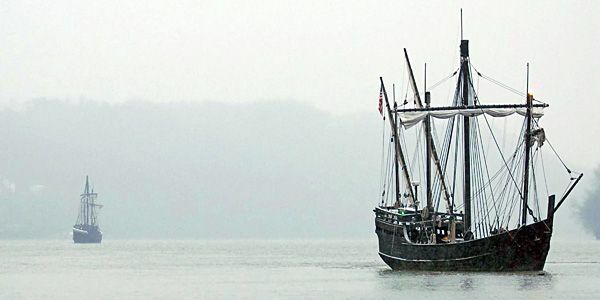 This article is about how somebody supposedly found the Santa Maria, or the boat Cristopher Columbus sailed in to find the new world. If it is really the same boat, I will wonder how it did not rot out and sink.